Ukraine's foreign minister said Thursday that one of Russia's most ambitious energy projects, the planned South Stream gas pipeline across the Black Sea to Europe, would be "wasteful, unnecessary and totally against the logic of modern economy." The unusually pointed criticism underscored lingering tension between the two former Soviet neighbors over energy despite a marked improvement in overall relations since the election of a Russia-friendly government in Ukraine early this year. Speaking to a group of Western reporters in Moscow, Foreign Minister Kostyantyn Hryshchenko also reaffirmed Ukraine's opposition to a takeover of its state energy firm, Naftogaz, by Russia's OAO Gazprom or a merger of the two as proposed by Moscow. Ukraine is seeking a discount on the natural gas it buys from Russia. Russian officials say lower prices could be achieved by merging the two energy companies, giving Gazprom control over the lucrative network of pipelines that move Russian natural gas across Ukraine to Europe. Instead, Ukraine has proposed setting up a joint venture in which Gazprom and Naftogaz would have equal stakes. The venture, Ukrainian officials say, could develop Russian gas fields to supply Ukraine and upgrade the pipeline network to deliver greater volumes of gas to Europe. Mr. Hryshchenko said "limited investment" could expand the Ukrainian network's capacity by 50%, enabling it to deliver 180 billion cubic meters of gas to Europe each year. In light of that possibility, he said Russia's plan to spend $20 billion to build South Stream "in a rather difficult ecological and technological environment" makes no sense. Russia planned the South Stream pipeline to bypass Ukraine and reduce its dependence on the country as a transit hub for Europe-bound natural gas. "We are clearly telling our Russian friends but also Europeans that we offer an alternative," he said. "We don't see many complications that would inhibit Russia and Europe from using Ukraine as the best route to bring gas to European customers." 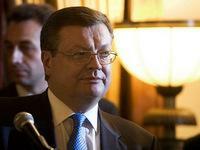 The minister was in Moscow for talks with his Russian counterpart on a range of bilateral issues. On Friday, Presidents Viktor Yanukovych of Ukraine and Dmitry Medvedev of Russia are to meet at the border for their eighth encounter since Yanukovych took office in February and ended years of frosty relations between the two countries. Mr. Hryshchenko said the thaw had made it easier for Ukrainians to trade with Russia and to travel there, and had opened opportunities for joint ventures in aircraft manufacture and nuclear power generation. He said the "gas wars" over energy prices that often disrupted supplies to Europe were a thing of the past. But he acknowledged that Ukrainian officials were surprised and put off by Prime Minister Vladimir Putin's proposal in May to merge the two countries' energy companies. "You know, when you look for opportunities rather than differences, different kind of ideas might emerge," he said. "But one shouldn't be carried away with the ideas unless they have an economically sound basis from the point of view of both sides."